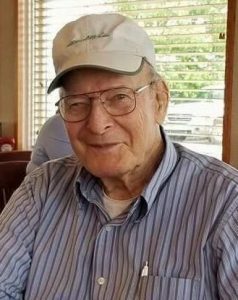 Born June 4, 1930, on the family farm in Ludington, Michigan, to the late Albert and Irene (Gifford) Lichte, he passed away November 4, 2018, at the age of 88. His parents divorced when he was 12 and his grandfather, Harry Gifford, had a bad heart and needed help on his farm, so much of the work was left up for Del to do. His grandparents moved to Lansing when Del was 15. He then went to Sexton High School and worked at Western Union delivering messages. Del was the fastest bike rider around! When he was in the 10th or 11th grade, a shop accident caused injury to his right eye when a sliver of metal flew in. A magnet could not remove it, so surgery caused problems and a cataract. He tried to get into Oldsmobile but the first test was an eye test, and he didn’t get the job. He worked for the Lansing State Journal type setting for awhile, and then worked at the Lewis Cass building for the State of Michigan as a blueprint operator. On the last day he worked before going into the Army they had a fire on the roof where he had been working! Del had met Zarada Gunter when she was 13, but didn’t reconnect until after she graduated in 1953. He went into the Army and was stationed in Salzburg, Austria. When he returned, he went back to his old job, got together with Zarada and they were married September 19, 1953. They lived in an apartment on Ionia St. for 3 years, saving $1,500 as a down payment on their home on Sommerset, which they moved into in 1956, which cost $9,500 at that time. Del worked several jobs: for Herm Cornell, Amiss Block and Martin Block delivering blocks, and delivering auto parts for Capitol Cadillac, Young’s of Lansing, and Spartan Toyota. He did work in Ludington in 1958 for his uncle in the woods cutting logs, but gave that up and came back to truck driving. His mother, Irene, married two more times. Ora Wright and Clifford Huff brought more stepbrothers and sisters into the picture! There were many good card games with the little ones sleeping on the floor. Del and wife Zarada had five tries at being parents, but it just was not God’s plan, so they were able to love ALL the nieces and nephews. Humor followed him wherever he went – from Red Skelton’s “ding-a-ling walk,” to his snakebite joke that nobody really got right away! He will be missed! Surviving are his wife of 65 years, Zarada (Gunter) Lichte; his three brothers, Lester, Roger, and Harold (Esther) Lichte; and many stepbrothers and sisters, nieces and nephews, too many to name. Del was cremated. A memorial celebration will be held from 4:00 – 8:00 p.m. on Saturday, May 18, 2019, at the Robin’s Nest, 6053 S. Clinton Trail, Eaton Rapids, MI. If you wish to make a memorial contribution in Del’s memory, please honor your church or any organization that you choose. I am so sorry for your loss Zarada. My thoughts and prayers are with you and you know that the “Happy Hookers” are always there for you, as are your swim buddies! Honorary Uncle (& Aunt Zee) to San & Buc, we hold many fond memories of our times together!! Del was a great one for telling jokes and kidding around and he will be truly missed. Rest in peace & God bless! !